O Maha-purusa, I worship Your lotus feet. You gave up the association of the goddess of fortune and all her opulence, which is most difficult to renounce and is hankered after by even the great demigods. Being the most faithful follower of the path of religion, You thus left for the forest in obedience to a brahmana’s curse. Out of sheer mercifulness You chased after the fallen conditioned souls, who are always in pursuit of the false enjoyment of illusion, and at the same time engaged in searching out Your own desired object, Lord Syamasundara. According to the Vaisnava acaryas, this important verse of the Srimad-Bhagavatam is understood to describe Caitanya Mahaprabhu, Lord Krsna and also Lord Sri Ramacandra. This verse appears within the discussion by the sage Karabhajana of the yugavataras, or the different incarnations of the Personality of Godhead who deliver the conditioned souls of each age. The prayers ending with the words vande maha-purusa te caranaravindam are understood to glorify the incarnation of Lord Krsna in Kali-yuga known as Caitanya Mahaprabhu. Caitanya Mahaprabhu lived for twenty-four years in Navadvipa as a householder and enjoyed immense popularity among both scholars and ordinary persons. His sankirtana movement was completely supported by the local government, even though it was Muslim. And Caitanya Mahaprabhu had the pleasure of marrying the goddess of fortune. No ordinary woman of the material world, no matter how gorgeous she may be, can in any way compare with the beautiful goddess of fortune. Everyone in the universe, including Lord Brahma, is searching after the goddess of fortune. Therefore it is stated here, surepsita. However, Caitanya Mahaprabhu is Lord Krsna appearing as a brahmana, and therefore He is certainly dharmisthah, or the most religious. Actually the Supreme Personality of Godhead is always dharmisthah, whether He appears as a cowherd boy, a great king or a brahmana, because the Lord Himself is the original source and personification of all religious principles. However, in the pastimes of Caitanya Mahaprabhu there are very few political or economic activities. Caitanya Mahaprabhu appeared as a great philosopher-brahmana, and thus He is certainly dharmisthah. In Caitanya-caritamrta, in the Seventeenth Chapter of the Adi-lila, it is described that a certain brahmana, who was well known for being harsh and cursing others, could not enter the kirtana hall where Caitanya Mahaprabhu was performing kirtana because the door was locked. Being very agitated and breaking his brahmana’s thread, he cursed Caitanya Mahaprabhu the next day on the bank of the Ganges, saying, “I shall now curse You, for Your behavior has greatly aggrieved me. You shall be bereft of all material happiness.” However, Caitanya Mahaprabhu felt great jubilation within Himself, since His mission was vairagya-vidya-nija-bhakti-yoga — to give up the illusion of material sense gratification and staunchly engage twenty-four hours a day in the devotional service of the Lord. Therefore, Caitanya Mahaprabhu took this curse as a blessing, and soon after, the Lord took sannyasa. Thus it is stated in this verse that by the words of the Aryan, the brahmana (arya-vacasa), Caitanya Mahaprabhu took sannyasa (yad agad aranyam) and went traveling through the different forests of India on the way to Vrndavana, and later South India. Caitanya Mahaprabhu wanted especially to preserve the prestige of the brahmana class, and therefore He decided to keep the brahmana’s curse intact. Srila Visvanatha Cakravarti Thakura has explained the word maya-mrgam as follows. Maya means one’s so-called wife, children and bank account, which keep one firmly bound up in the material bodily concept of life. The word mrgam indicates mrgyati, or “to search out.” Thus, maya-mrgam indicates the conditioned living entity, who is always frantically searching for the latest up-to-the-minute sense gratification in the material bodily concept of society, friendship and love. Anvadhavat indicates that Caitanya Mahaprabhu was always visibly going here and there, searching after the fallen conditioned souls. Caitanya Mahaprabhu would sometimes embrace the conditioned souls on the pretext of religious friendship or ecstasy. But actually, the Lord was touching the bodies of the conditioned souls to pull them out of the ocean of material existence and hurl them into the ocean of ecstatic love of Godhead. Thus Caitanya Mahaprabhu was the most merciful and munificent incarnation of the Lord, whose mercy surpassed the bounds of mundane discrimination in the matter of caste, color and creed. The word dayitaya can be explained as follows. The Sanskrit word daya means “mercy.” Thus, by grammatical derivation, the word used in this verse, dayitaya, indicates that because of being the most merciful, Caitanya Mahaprabhu was busily engaged in rescuing the fallen conditioned souls, who are completely distracted and bewildered by the external illusory energy of the Lord. The quality of being the most merciful is part and parcel of the character of the maha-purusa, or the Supreme Personality of Godhead. According to Srila Jiva Gosvami, this verse also describes the incarnation of Lord Krsna Himself in His original blackish form. Thus the words surepsita-rajya-laksmim indicate sri-mathura-sampattim, or the opulence of Mathura. Mathura is described in Vedic literature as the reservoir of all opulence because of the touch of the Lord’s lotus feet in that precinct. 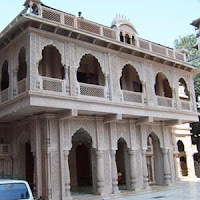 But Krsna, although taking birth in the opulent city of Mathura, transferred Himself to the forest village of Vrndavana. In this case the word arya-vacasa indicates the order of Lord Krsna’s original parents, Vasudeva and Devaki. In Srimad-Bhagavatam (10.3.22, 29) both Vasudeva and Devaki express their fear at the threat of Kamsa, who had already killed all of Krsna’s elder brothers. The word arya-vacasa thus indicates that with great love they requested Krsna to kindly make some arrangement to avoid Kamsa. And Krsna, to obey their order, transferred Himself to the forest village of Vrndavana (yad agad aranyam). In this context, the words maya-mrgam indicate the special, exalted relationship between Srimati Radharani and Sri Krsna. Maya also indicates the internal potency of Krsna, yoga-maya. The original form of Krsna’s internal potency is Srimati Radharani. Due to the inconceivable love of Srimati Radharani, Lord Krsna becomes easily controlled by Her. Thus, mrgam, or “animal,” in this case indicates krida-mrgam, or “a toy animal.” Just as a beautiful young girl may play with so many dolls or stuffed animals, similarly Lord Krsna becomes just like a doll in the hands of the most beautiful young girl, Srimati Radharani. According to Srila Jiva Gosvami, Srimati Radharani performed innumerable types of worship in order to bind Krsna more and more to Her because Srimati Radharani cannot live without Krsna. Thus, due to Srimati Radharani’s aradhana, or worship, Krsna can never leave Vrndavana. He runs here and there in Vrndavana, protecting the cows, playing with His friends and engaging in countless intrigues of love with Srimati Radharani and the gopis. Thus the word anvadhavat indicates Krsna’s boyish activities, His running throughout the transcendental land of Vrndavana, tightly under the control of the love of Srimati Radharani. Srila Sridhara Svami has explained how this verse also describes the incarnation of Lord Sri Ramacandra. Although the Lord is completely independent and detached from everything, He becomes attached to His pure devotees due to their love for Him. In the great capital of Ayodhya all of the citizens loved Ramacandra more than can be described. In this context arya-vacasa means that by the order of His father, who was just like His guru, Ramacandra gave up everything and went to the forest. There He exhibited His great affection for mother Sita and chased after maya-mrgam, or the illusory deer that had been created by the trick of Ravana. That this golden deer was especially desired by Srimati Sitadevi is indicated by the word dayitayepsitam. All of the limbs (angani) of the Supreme Lord are sakalendriya-vrttimanti, or possessing all of the functions of all of the other limbs. Thus the two lotus feet of the Personality of Godhead are a plenary representation of the Supreme Personality of Godhead, and worshiping the Lord’s lotus feet immediately places the worshiper in the ocean of transcendental bliss. There is no factual difference in spiritual quality between the incarnations of Caitanya Mahaprabhu, Lord Krsna and Lord Sri Ramacandra. As stated in Vedic literatures, advaitam acyutam anadim ananta-rupam. Therefore there is no contradiction in the opinions of the acaryas that this verse wonderfully glorifies three different manifestations of the one Absolute Truth. Caitanya Mahaprabhu is undoubtedly the Supreme Personality of Godhead. His transcendental attributes fulfill in every sense of the term the descriptions of the Absolute Truth as given in Vedic literature. In Caitanya-caritamrta, in the Third Chapter of the Adi-lila, Krsnadasa Kaviraja Gosvami and Srila Prabhupada have given elaborate explanations of the transcendental status of Sri Caitanya Mahaprabhu, which the reader can refer to for further information. Everyone should follow the example of the sage Karabhajana and worship the lotus feet of the Mahaprabhu, the maha-purusa, Sri Caitanya Mahaprabhu. One should not rot on the platform of mental speculation and whimsical interpretation but should actually revive his lost relationship with the Absolute Truth by surrendering to Caitanya Mahaprabhu. Those who are worshiping Caitanya Mahaprabhu are deriving wonderful spiritual results and are tasting the fruit of love of Krsna. Therefore, vande maha-purusa te caranaravindam: let us humbly bow down at the lotus feet of the original Personality of Godhead, Sri Caitanya Mahaprabhu, who is the maha-purusa glorified within Srimad-Bhagavatam. Corroborating the explanation of this verse, the followers of Caitanya Mahaprabhu also worship Him in His six-armed form of sad-bhuja. Two arms carry the waterpot and danda of the sannyasi Caitanya Mahaprabhu, two arms carry the flute of Lord Krsna, and two arms carry the bow and arrow of Sri Ramacandra. This sad-bhuja form is the actual purport of this verse of Srimad-Bhagavatam.